This weekend, Carnegie Mellon Carnival attendees had the opportunity to see this year's Scotch'n'Soda Carnival slot musical Merrily We Roll Along. A work of pure genius from Stephen Sondheim and George Furth, Merrily explores the progression of a friendship among three people in reverse chronological order. There are many reasons Merrily is one of my favorite musicals, if not my favorite. Not only does it expertly examine friendship withstanding — or not withstanding — the test of time after college and throughout life, but it follows the creative partnership between composer and lyricist through music written by one of the masters himself. I attended the 11 p.m. show on Saturday night. It was the last night of Carnival, right after the concert, when campus was full of revelers and those with just a little too much enthusiasm. The show definitely reflected that. Though giggling, heckling, and whooping abounded, the performers managed to stay in character as much as possible and pull off a relatively cohesive performance. The three friends — Frank, Charlie, and Mary — have incredibly complicated relationships, and following them backward through time has the potential to be very confusing. Frank, played by sophomore vocal performance major Angelo Ragghianti, is a very successful composer at the beginning of the musical, (which is technically the end, chronologically.) 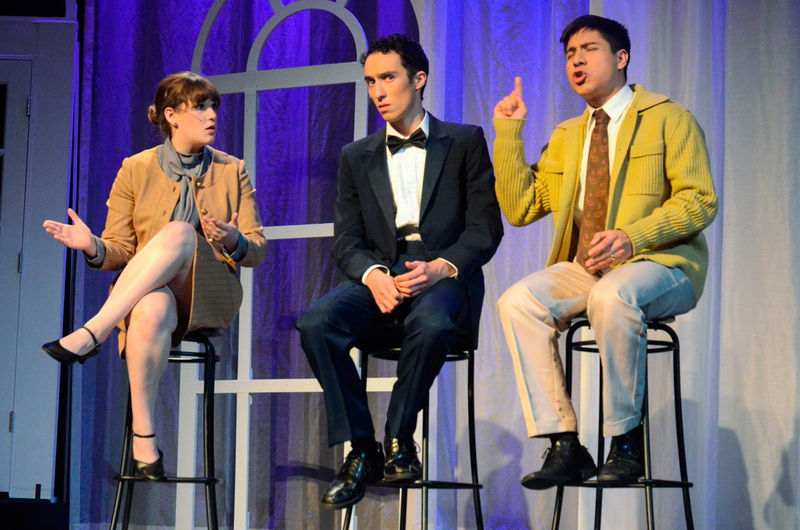 His relationship with Charlie, played by junior vocal performance major Camilo Estrada, has been fractured by Frank's more commercial aspirations coming at the expense of his collaboration with his lyricist friend. First-year directing major Burke Lewis portrayed the somewhat hapless and disillusioned Mary. At the beginning of the musical Mary yells at Frank, effectively disintegrating their friendship in much the same way that his friendship with Charlie has disintegrated. Mary is a drunk, and teeters around the stage bemoaning the end of the trio's age old relationship. The musical proceeds in a slightly happier direction after that. Audiences see Frank and Charlie's falling out more closely, the dissolution of Frank's first marriage as a result of an affair, Frank and Charlie's brief but unhappy success, Mary's rise as successful author, Frank and Charlie's struggles to make it in the world of theater as college graduates, and lastly the evening the three of them met. As a person who knows the musical well, I might have had an easier time than most following the storyline through the years. Both Ragghianti and Estrada's voices carried well and gracefully performed Sondheim's complicated and rapid musical numbers. The song in which Charlie blows up at Frank on national TV — "Franklin Shepard, Inc." — required vocal gymnastics from Estrada and was executed practically perfectly. The pit orchestra also performed the notoriously tricky repertoire with grace. Led by sophomore composition major Andrew Dewey, the various musicians sounded clean and together, even through some of the stickier spots onstage. Sophomore music performance major Laurel Beatty even managed to make cool and on tempo typewriter sound effects for the song "Opening Doors." Though the production had a variety of strengths, there were some areas that were a little less enjoyable. The Saturday night show probably had some discrepancies with the rest of the performances, but some of the problems were probably consistent over the course of the run. There was very little choreography during the production, which is partly the nature of the musical, but it also would have been nice to see some variety onstage. The ensemble often looked a little awkward and still during the transition numbers. Even having a couple dancers onstage in addition to the vocal chorus might have livened up some of the staging and given the audience much-needed visual stimulation. The chemistry between the three leads was also a little off. As an audience member I didn't find their friendship that believable, and I found that it gave the musical less integrity, because I didn't feel as emotionally invested in their relationship. Part of this issue was due to strange staging. Because of this, some of the more emotional lines of the musical came out a little cliché, rather than as heartwarming or tragic as they are supposed to sound. At the end of the day, the extensive effort expended by those in the production was met with enthusiastic applause. Though the production might not have had the more seamless execution of past Carnival slot musicals, the thought-provoking nature of the musical left audiences considering their past and present friendships and the way time and circumstance has, and will, change them. This Carnival, Merrily We Roll Along still had the capacity to evoke these thoughts in those in attendance, and that is no small feat.